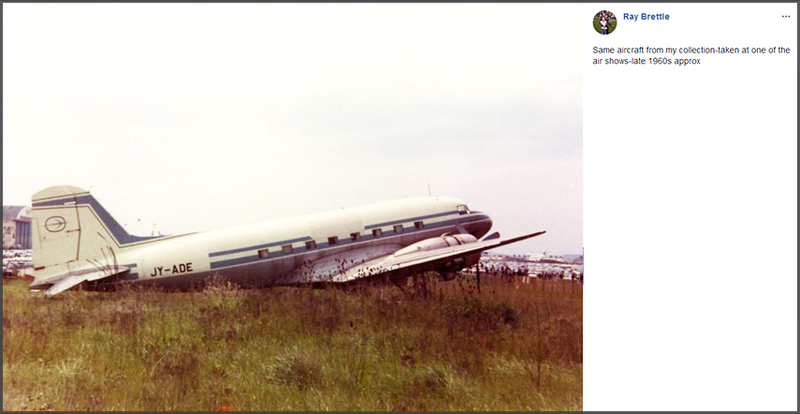 With the ever growing popularity of Social Media (Flickr, Facebook, Instagram) the barrier has become much lower for people to share their photographs or scans of slides; imperfection to post aviation images is no longer an issue. I noticed a decline in requests for publication on my website (a decline I welcome, as I struggle with the workflow) on my 'Guest Pages', so now some of these images shared below will be copied from Facebook & Flickr by me. For preservation of their historic value as I see it; always with proper credit to the photographer, of course! 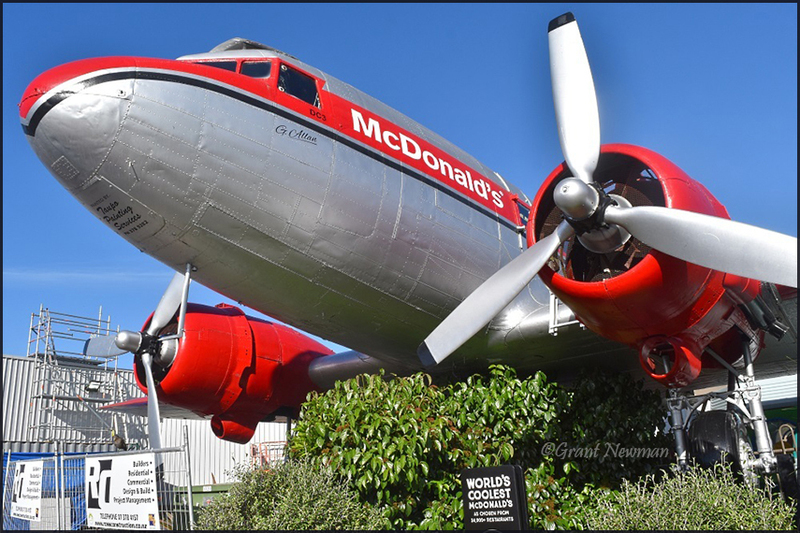 Btw, while I am on social media, picking up on aviation news, I use it mainly for other interests while my website remains my main focus to share my interest in vintage aviation. 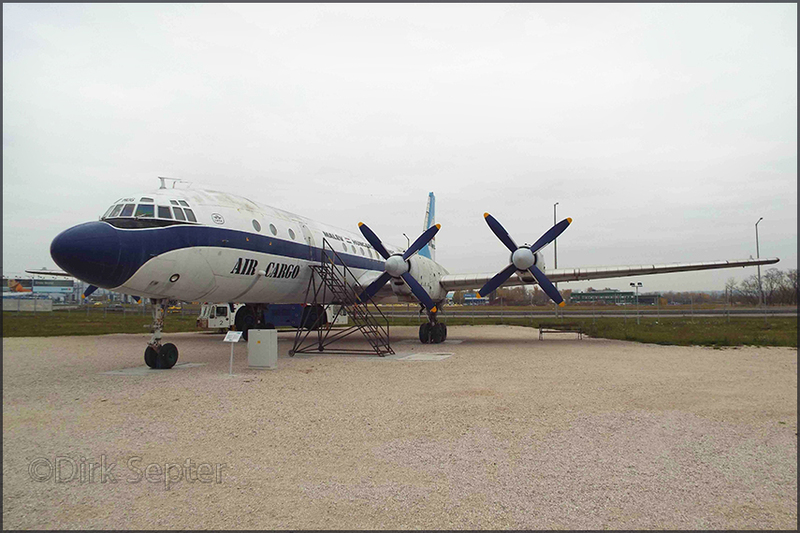 Malcolm Gow came across this Lockheed C-121C Constellation HB-RSC at Basle on 16Jun2014. In June 2017 news was published that the Breitling Connie was to be grounded for the remainder of 2017. Due to finances. 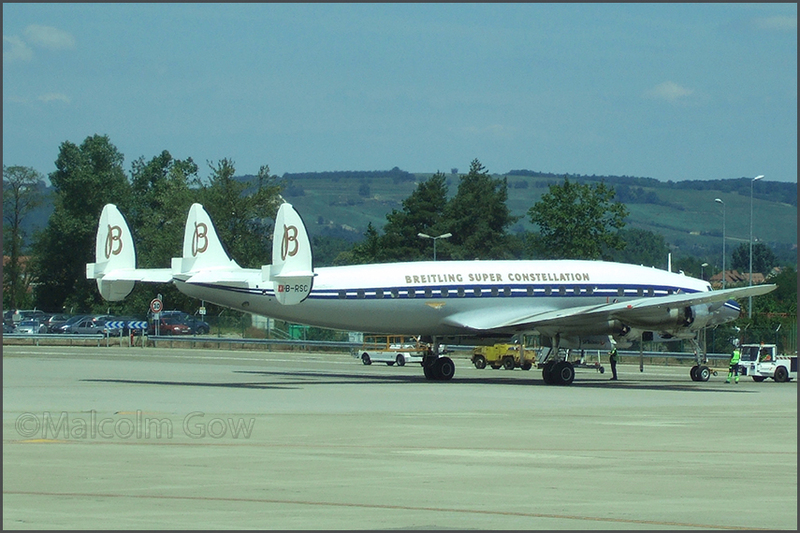 An action was started 'Save our Connie, the Breitling Super Constellation'. 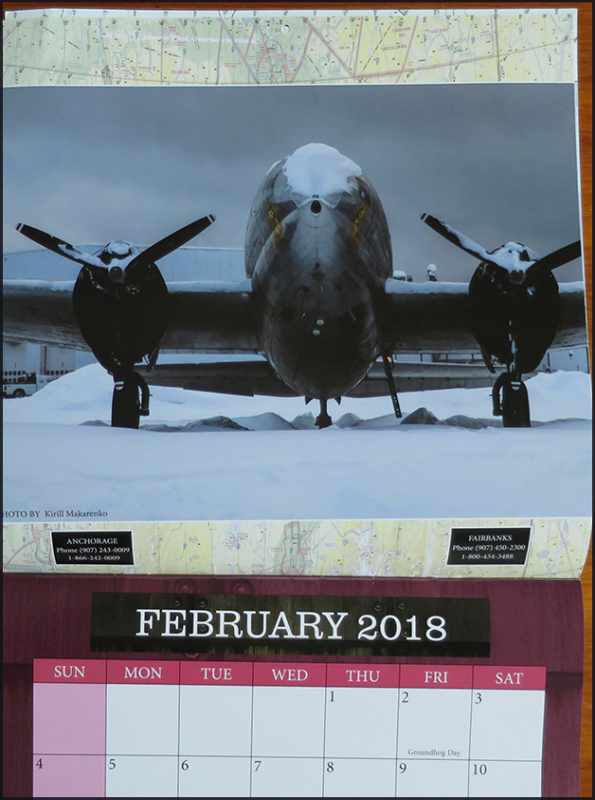 The on 03Jan2018: 'The Connie will fly again'. 'On 25No2017, the assembly of Connie owners approved the plans and decisions made by the SCFA board members, and unanimously voted in favor of all requests presented by the board. The 2016/2017 annual report as well as the 2016/2017 annual financial statement were approved and authorized; additionally, the 2017/2018 budgetary plans were also authorized. 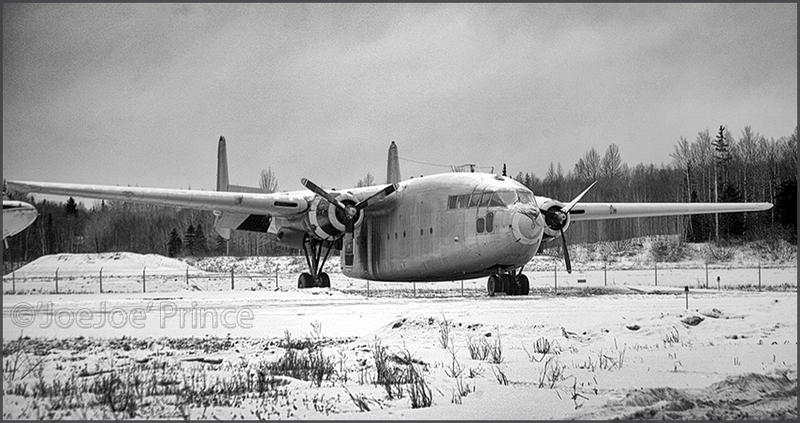 The association assembly has hereby laid the foundation for a thorough inspection of our «Grand Old Lady» during the coming winter months which will help get the Connie back to an airworthy status by the spring. 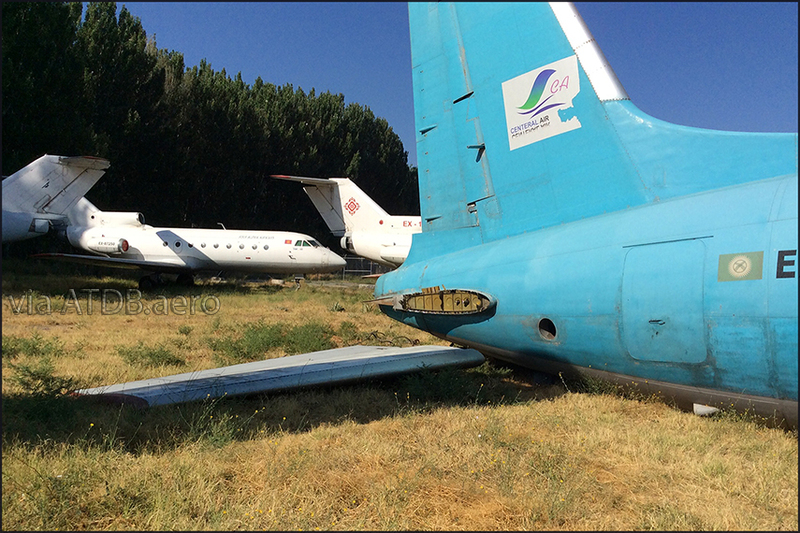 Jay Brettle sent me this image, for a DC-3 among the Bill Hill Gallery update I could not identify. Made another update to the gallery The Bill Hill Collection on my website, 6 images. Douglas DC-2 PH-AKK (c/n 1357) of KLM 'Koninklijke Luchtvaart Maatschappij'. 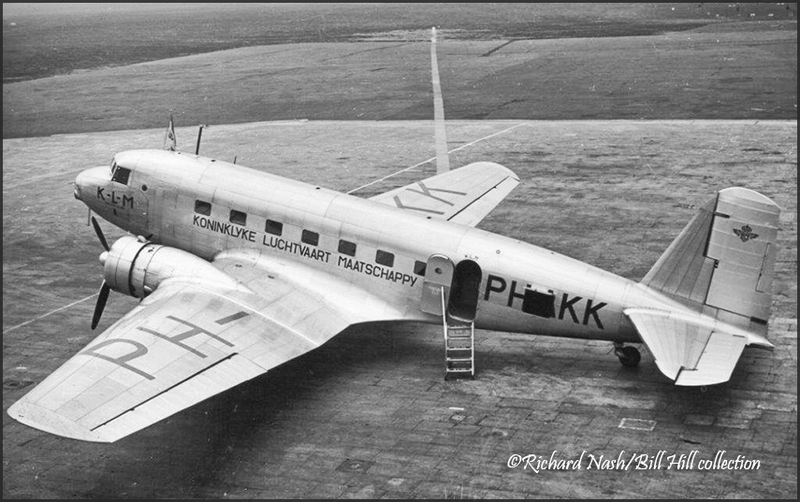 This DC-2 was assembled by Fokker (#17) and destroyed on 10May1940 at Schiphol-AMSterdam (bombed). 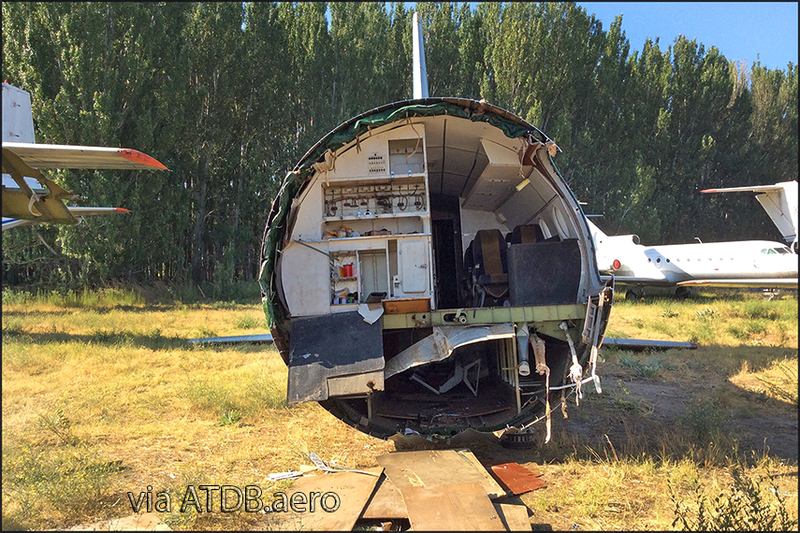 I visited this DC-3 0-7220 (17220) at McCall (Idaho) in 2014 and recorded its history on my USA 2014 report. Lars wrote: "I stopped today to snap a few [pictures] from her less photogenic side. make a credible static display. I contacted him a couple days ago to ask for a look inside. If I find anything interesting, I’ll post here." Phil Niewald shared this photo on Beech 18/ C45/ AT11/ SNB Group (Facebook). I thought it was one for my Off-airport gallery, but it so happens it is on Marshall's Harrison County Airport. Terry Sullivan wrote here: " Gate Guard at CAF Lone Star Wing, Marshall TX(KASL). A composite airframe formerly from the Corley Tedder 'collection'. 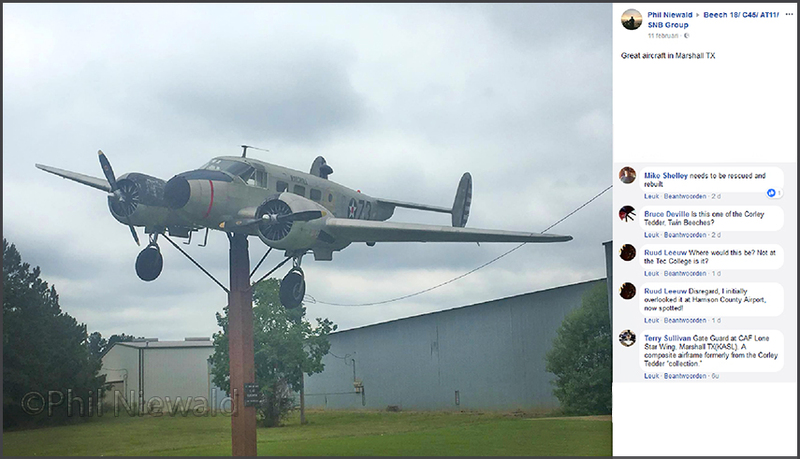 Survivors 2017 has two Beech 18s in Marshall,TX: N6132 (probably unmarked or painted over) and N11000. 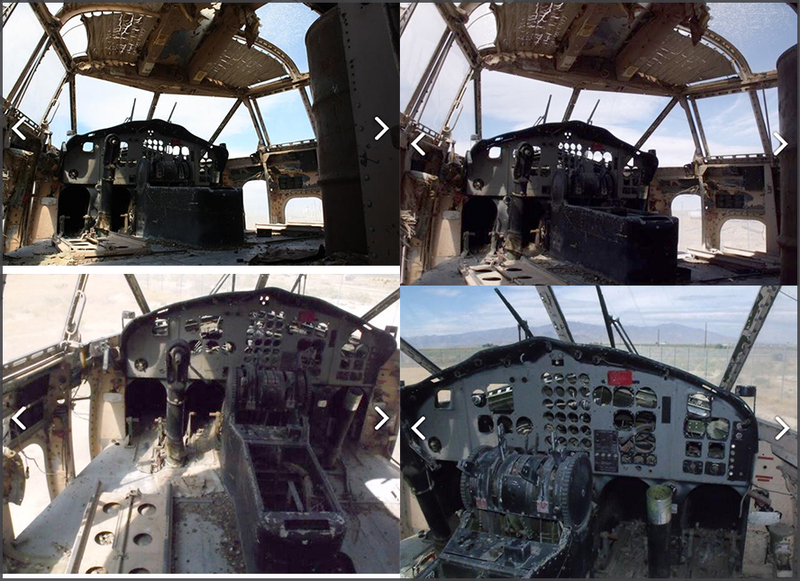 Bruce Deville wrote with the FB post: "N11000 was an old 'tech school' Beech that Corley Tedder purchased as a package of two airplanes, in I think, the 1980s. In the early 1990s I purchased N11000 as an empty shell to restore. Some month later I decided to trade N11000 back to Corley for another airframe and restore it instead. That was N9152. 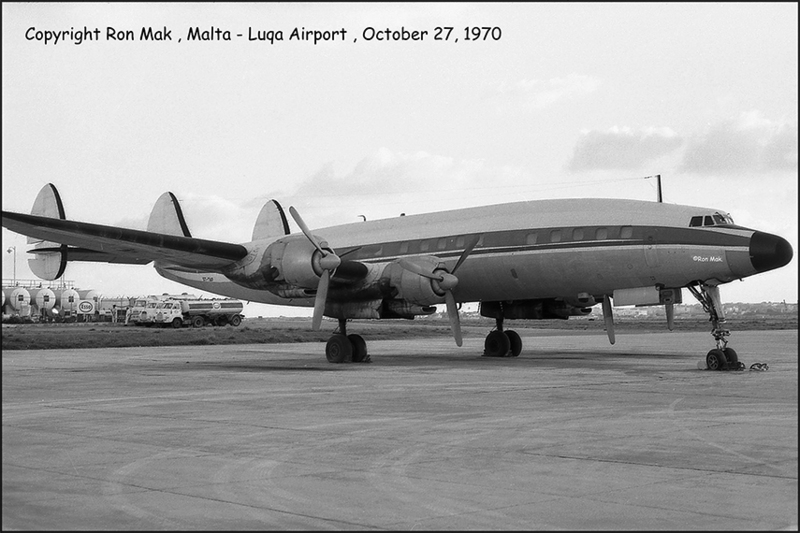 That would make this UC-45J c/n 67128. I had N9152 last owned by Richard Nielsen of Lynch, NE. 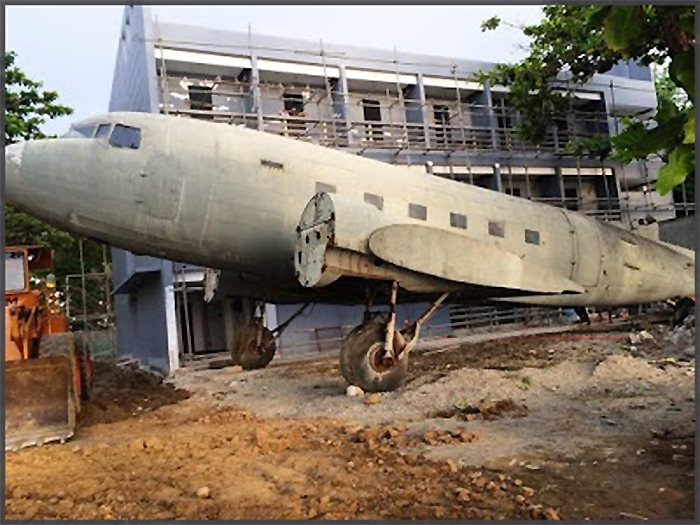 Charlie's Hangar Surf Hostel DC-3... These images were sent to me by Juergen Scherbarth last month. 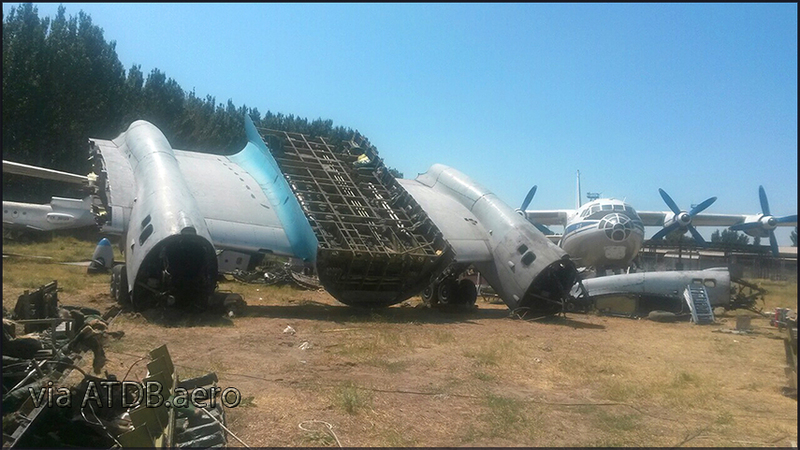 Juergen wrote here: "At least since 2014 two unidentified and disassembled C-47 fuselages, with detached wings and engines, were present at the current location. Note attached GE image dating 2015. According to my information they’re still waiting to be identified. 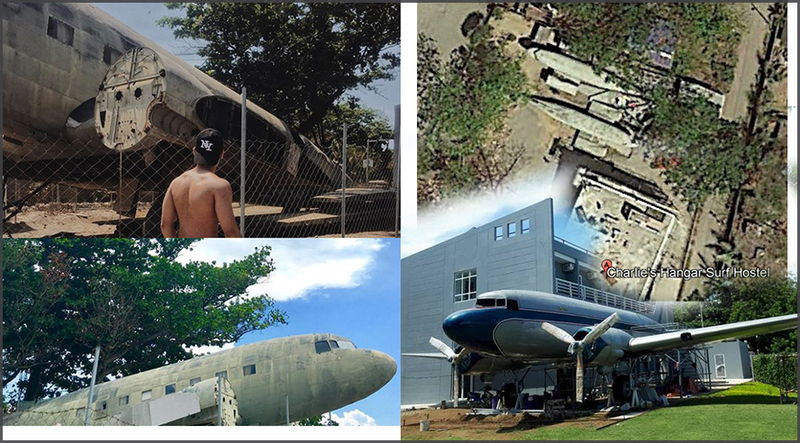 Maybe ex/ PAF C-47s from former Nichols AB, Manila...?" The adress is Surfer's Road, Brgy. Urbiztondo - 2514 San Juan (La Union). Ron Mak wrote (webmaster's translation): 'This is on the Philippines, San Fernando is the nearest big town and there is a small airport nearby: La Union on the Luzon Sea; beautiful location, splendid beaches and magnificent scenery. 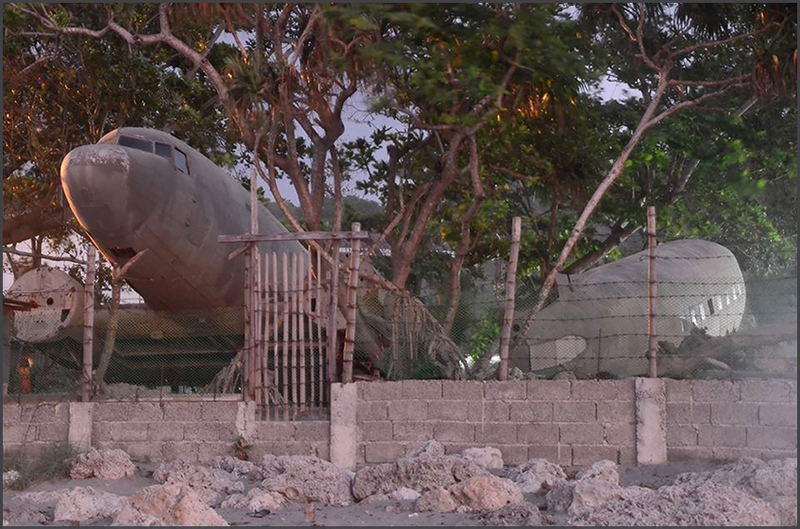 Check Google Earth, you'll be able to find Charlie's Surf Hostal and a 2nd DC-3 somewhat in ortherly direction nearby. 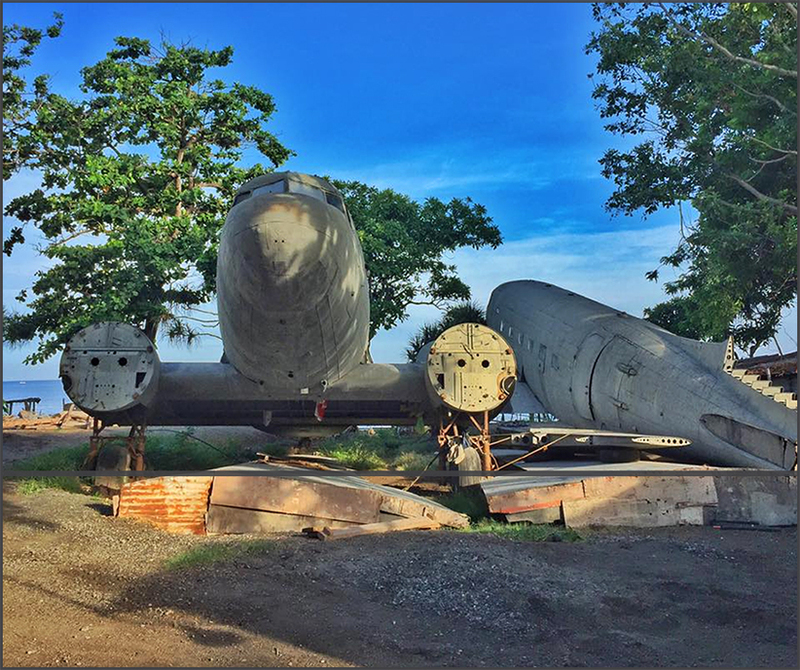 These 2 DC-3s probably originate from Manila's - Ninoy Aquino International; they are cleaning up the long-term stored (derelict) propliners, as with the recently moved Constellation (gone to HARS). Many of the direlict wrecks seem to have disappeared without trace. Suggestions to their identities please EMAIL me, add the url and be specific on the subject - thank you. 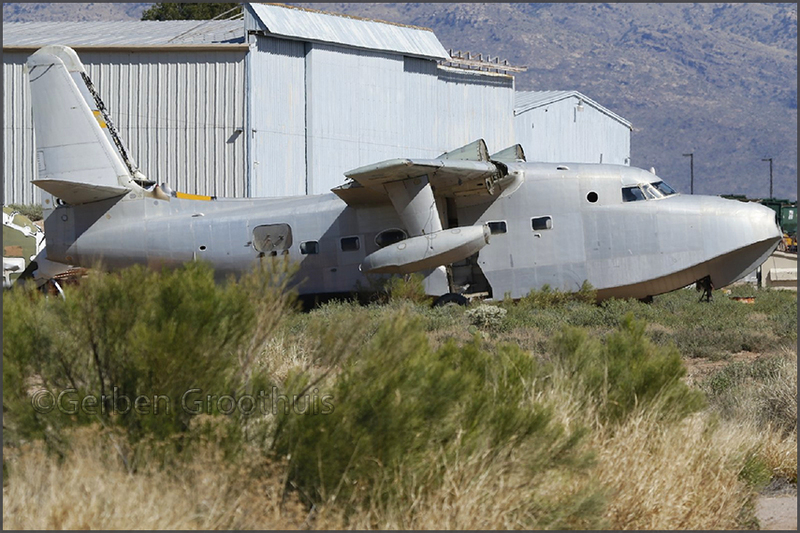 Finally we have some more information on the destiny of the C-119 stored at Battle Mountain,NV ! I have to thank 'JoeJoe' Prince for making me aware of this noteworthy news! "It started, like so many unlikely tales, with two bored guys sitting in a vehicle. 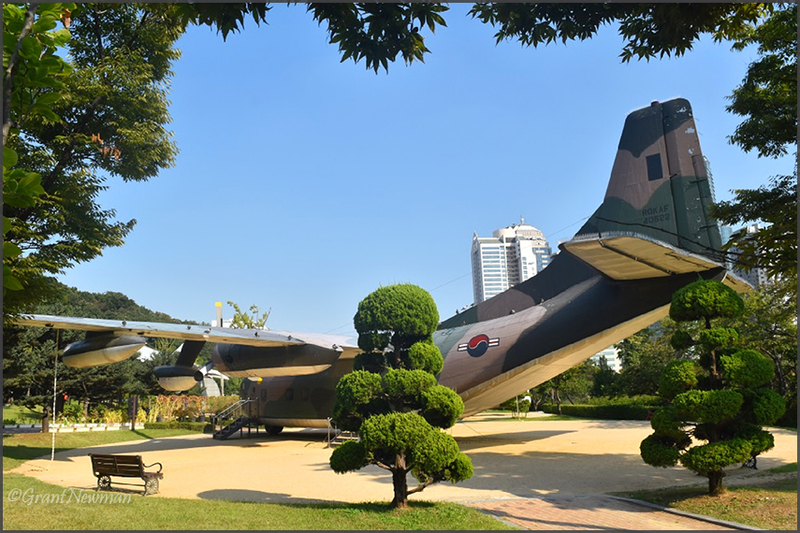 It's a humble craft—a big, bulbous rectangle with wings on top—built to carry vehicles, troops or guns, and retired by the Air Force more than 40 years ago. Morris said, "Wouldn't that make a great party bus?" It was a random comment, but Will said it made his head explode. This had to be done. I got a variety of answers to that question. 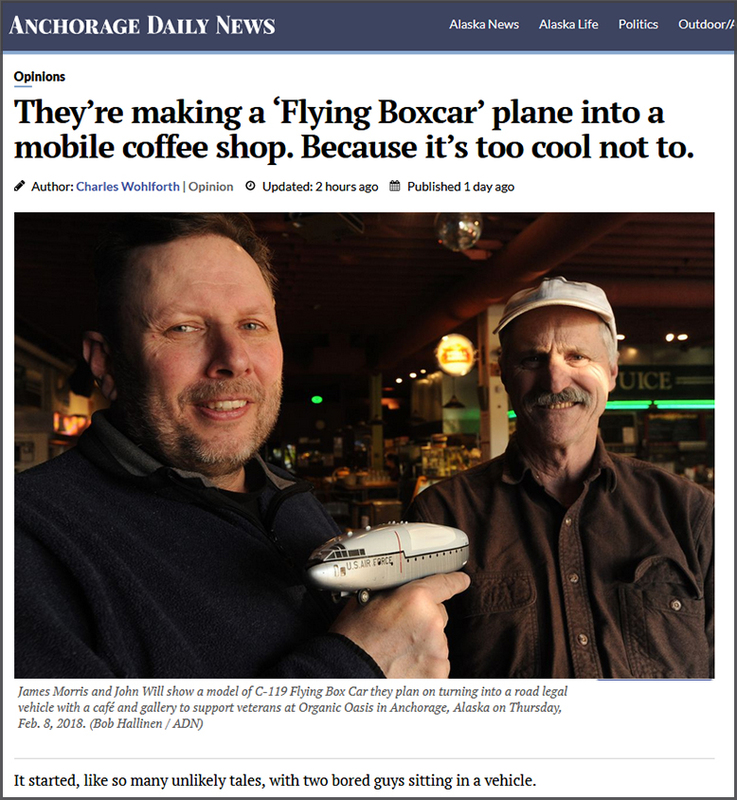 "It's about the only plane you can do it with," Morris explained. "Most planes are round." "I like building weird things," Will said. "I'm itching to get on this." Morris explained that the driver's seat would be in the restored cockpit, high above the road." John Will clarified the project to me (March 2018): "It will not be used to spice up a new coffee shop. It will be a mobile venue where Veterans can explore military history, connect with each other, and be recognized for their contributions through art and memorabilia. We are a non-profit and we will be donating to other Alaska based veteran organizations that need support." In Sep.2018 John confirmed ""We are still on track with the project. We have been doing fund raisers and getting the word out. We are currently waiting on some paperwork from the Government to clear the title for us and you know how long it takes Uncle Sam to do anything, but should be any day now. 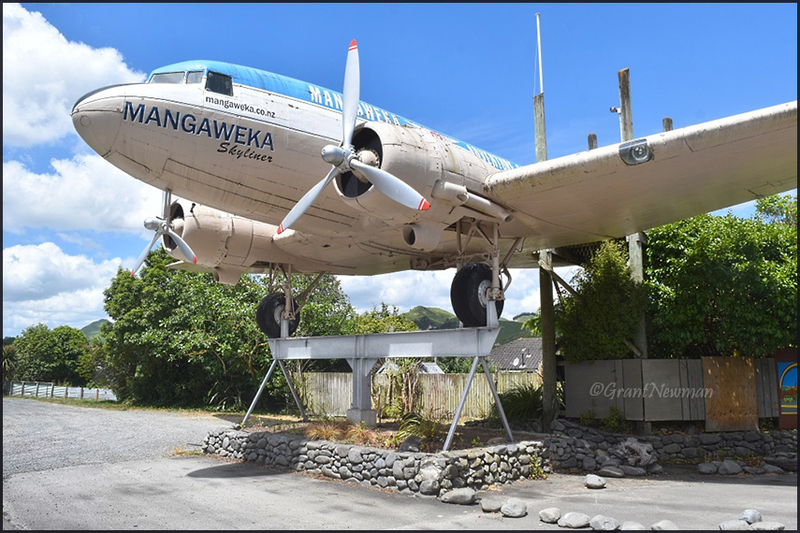 We are going to be telling the story and fashioning the fuselage after Gamble Chalk One, a C-119 (51-2560) that crashed up here in 1952 with 5 airmen and 14 soldiers on board. 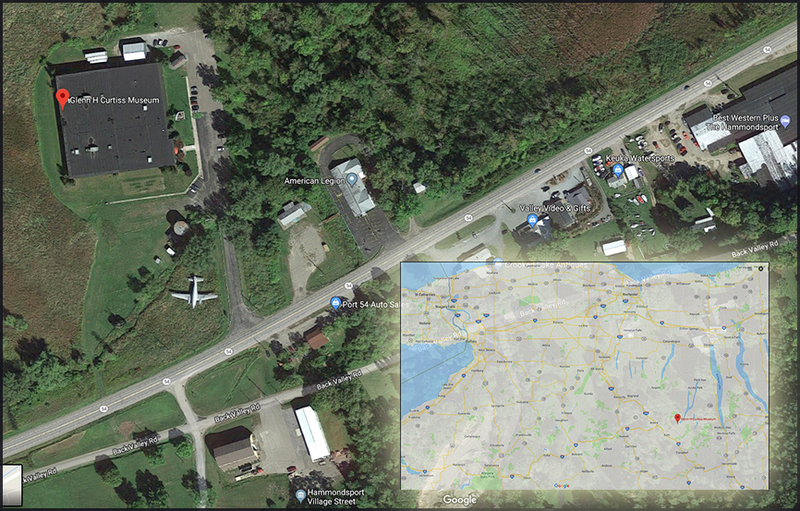 They just found the wreckage and will be doing a lot of work there in the coming years to exhume all the bodies that are still there and give them a proper burial." a number of years. A purchase is complicatedbecause, according to the advertisement, a 'bill of sale' cannot be provided. This advert did include a few photos of the interior. 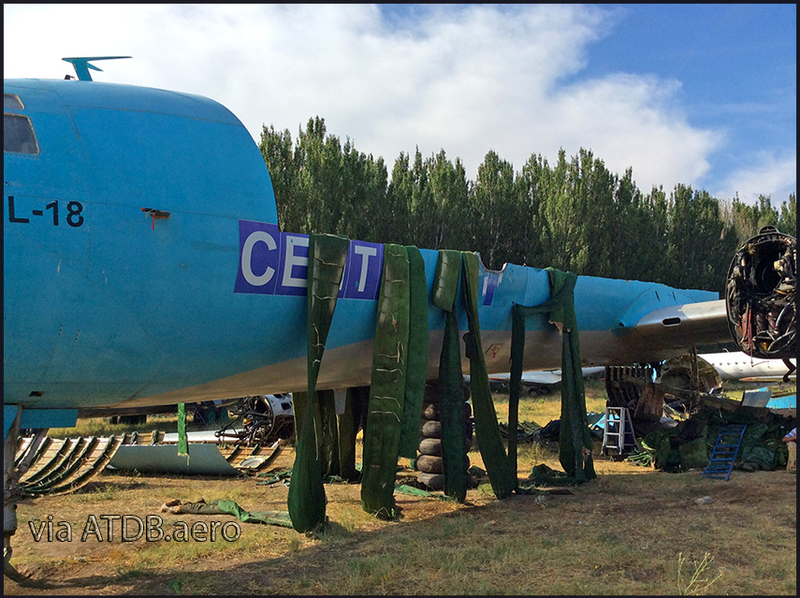 C-119 N5216R at Battle Mountain offered for sale again, time running out..? Or just say hi to John at John -AT- rollingboxcar -DOT- com. ROLL ON!" Yute Commuter Services wrote: "Our Beaver is up and ready for business! In 2006 and 2012 I came across it at Lake Hood, for sale. Good to see it has found a new owner! Here's my gallery of my correspondent at Bethel,Alaska! Andy Mac sent me this photo, EXIF data shows 28Jan18. 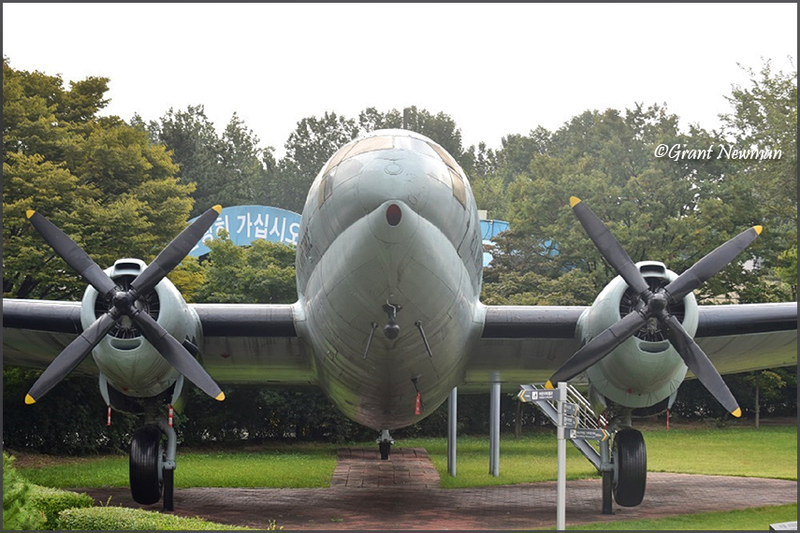 Douglas C-47 N8061A (c/n 6085). Andy wrote: "A but scruffy but flying nevertheless, making a fuel stop at Lincoln, NE while heading north to Ohio." 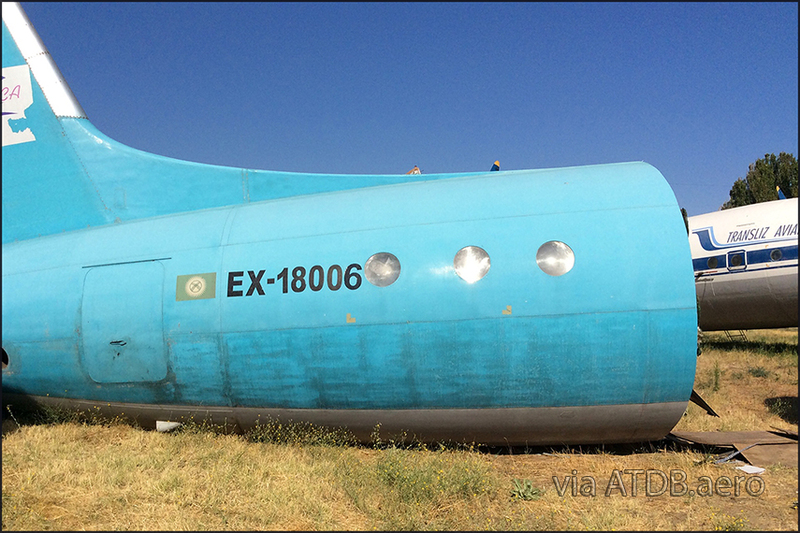 "N8061A was in Lincoln,NE is because it was on its way to its final resting place: Spanish Fork Airport Springville-Woodhouse Field, Spanish Fork in Uah (KSPK); its final flight was on 29Jan2018 and it will be dismantled to become part of a children's playground." 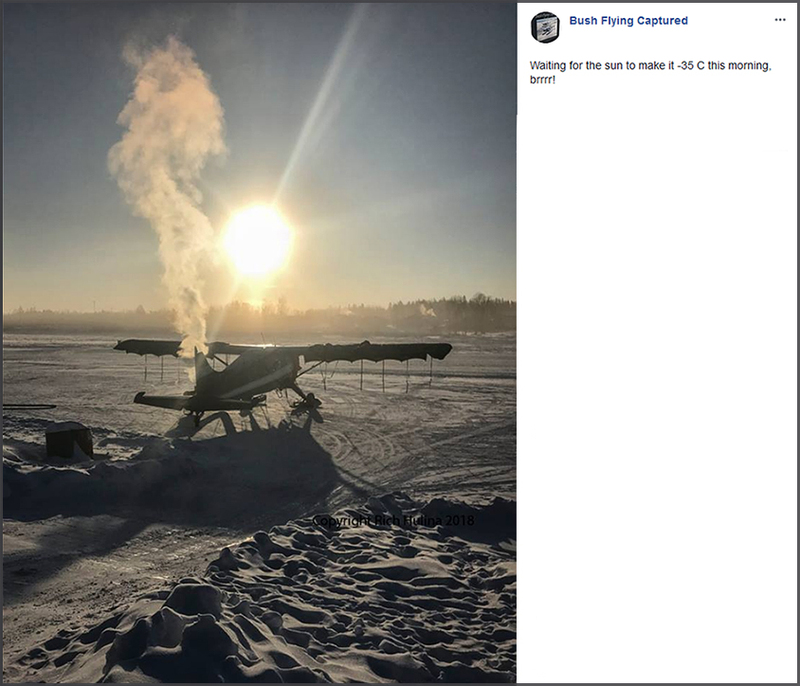 Roger continued: "N8061A had already been with Preferred Airparts LLC at Kidron, OH, since at least 13Apr2017, when I first photographed it there. I photographed it there again on 01Aug2017 – see the attached photo." 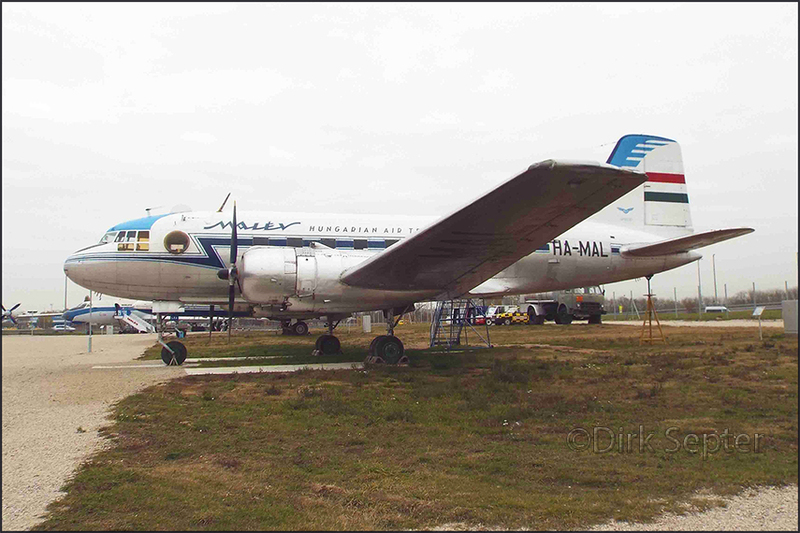 "This photo also shows some other C-47s/DC-3s: to the left: N3BA (sadly by now devoid of paint) -to the right, from the front to the rear: N566PT (ex N50CM), N562PT (ex N81907), N192RD (by now reregistered to N563PT), N332RD (by now reregistered to N564PT) and N193RD (by now reregistered to N565PT). Not visible on this photo, but also present, were: N403JB, N467KS, N882TP, the fuselage of N834TP, and the fuselage (sans cockpit) of XA-RPE. 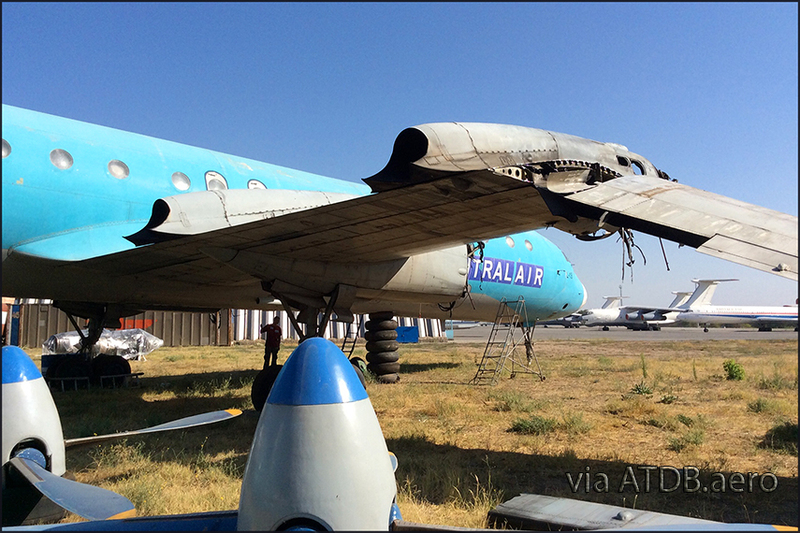 In addition, two C-47s/DC-3s were under major overhaul, but I wasn’t allowed to go near them... They may have been N560PT and N561PT." Bought by ABX Holding 09Feb19; we may see a new lease of life, not sure if it was converted to Turbo engines. I think it was last operated by Everts Air Fuel and it is still owned by them. 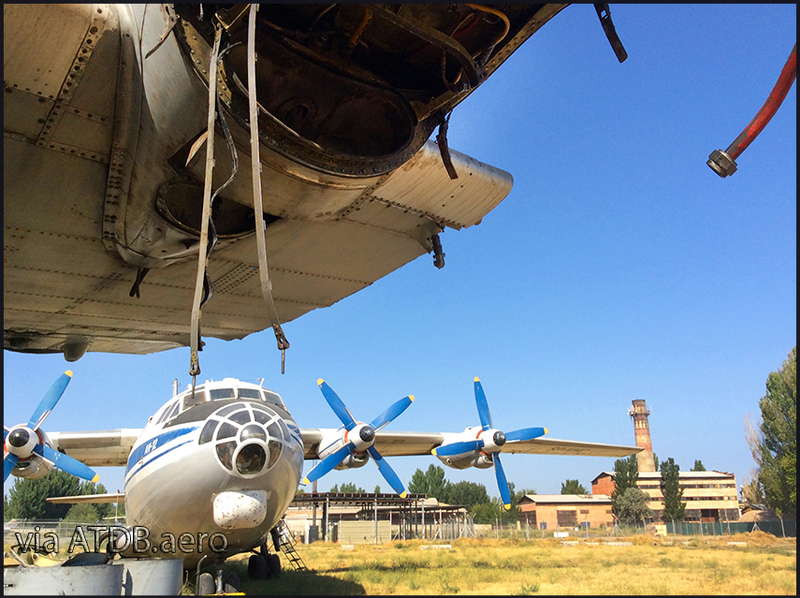 Everts declined, they have the history and preservation of the C-119 and DC-6 too close to their heart... Good job! 'February' is my favourite month on this calendar. Photo by Kirill Makarenko. 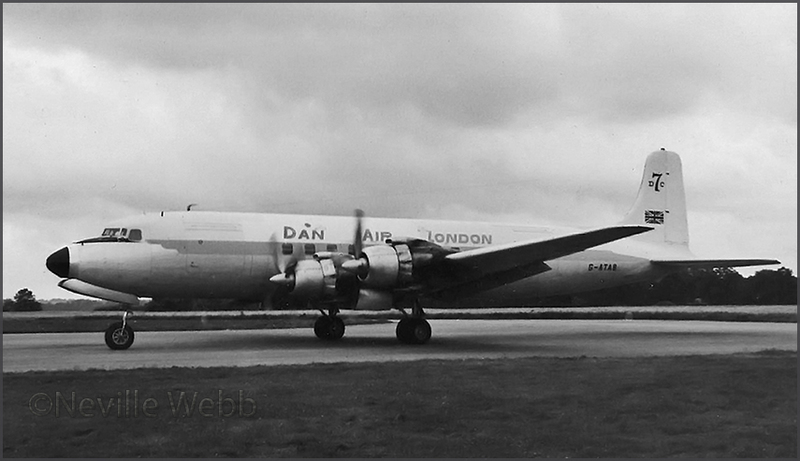 G-ATAB, being converted to DC-7B in Dec.'60) and Dan-Air London was 3rd and last. 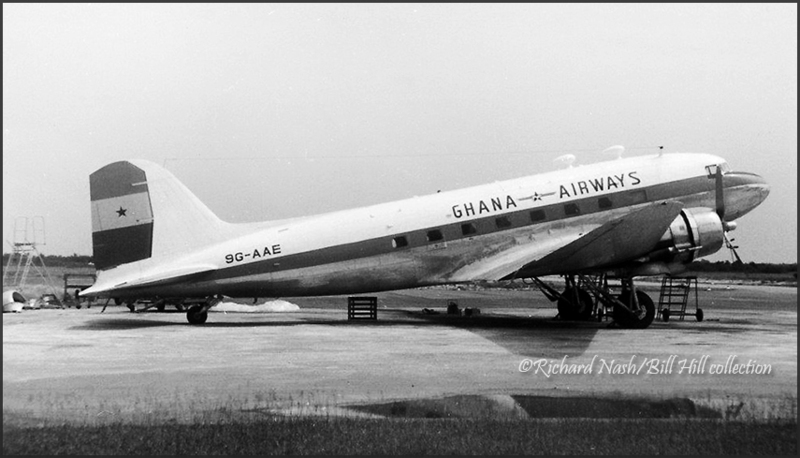 G-ATAB was scrapped at Lasham (EGHL) in 1973. Photo by Neville Webb (1966); for more see HIS GALLERY on my website. 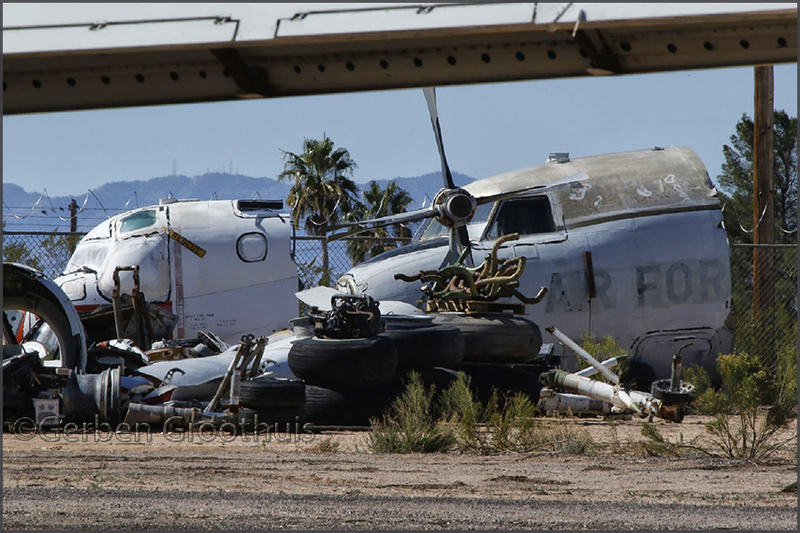 at the Pima Air Museum? I know about the TS-2A next to it, that's N425DF/136583/D-401." 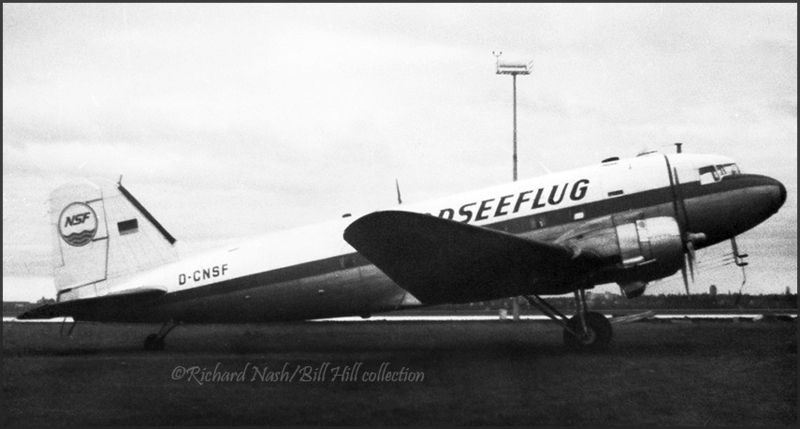 Other airframes that need identification: Searchfor..
C-47 D-CNSF of Nordseeflug by Bill Hill; images provided by Richard Nash. 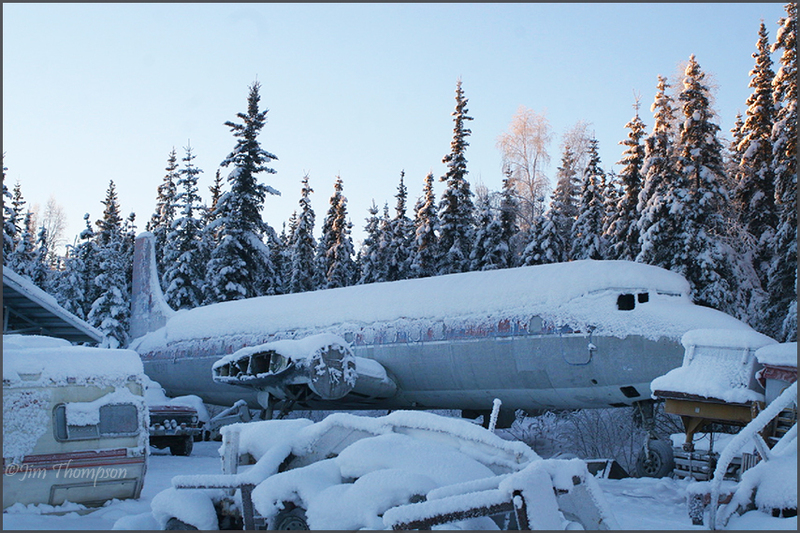 Douglas DC-6 N12347 (c/n 44071/401) by Jim Thompson shows a nice winterscene in northern Alaska. 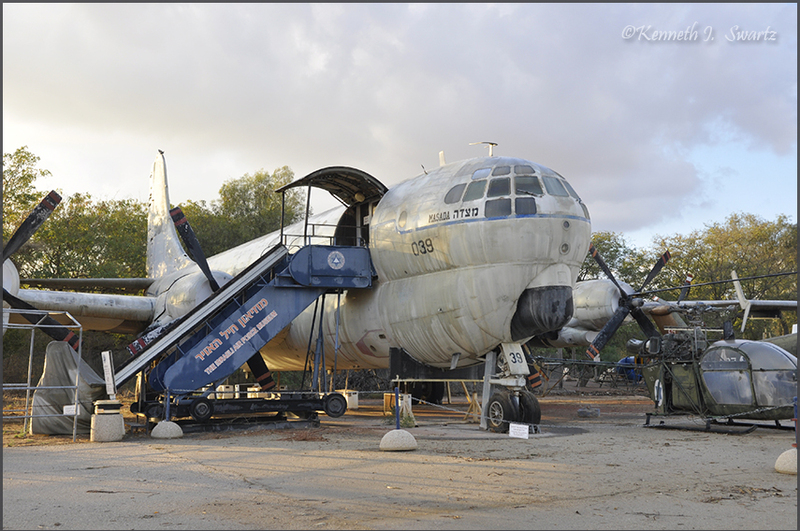 N12347 was moved in 2003 and, alas, the owner seems to have made little progress to convert it to his 'man cave'..? I recorded it on film in 1995 and on that page you'll find a 1991 photo as well. Last time I was in Alaska in 2012, but I did not make it to this one; next time!!! Rich Hulina shared this photo, winter in west Ontario! 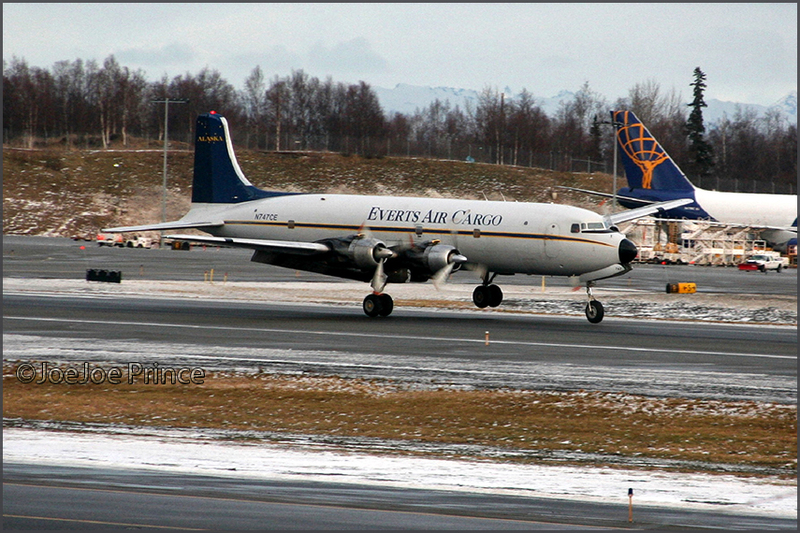 'JoeJoe' Prince sent me this photo of Everts' N747CE landing at ANC. 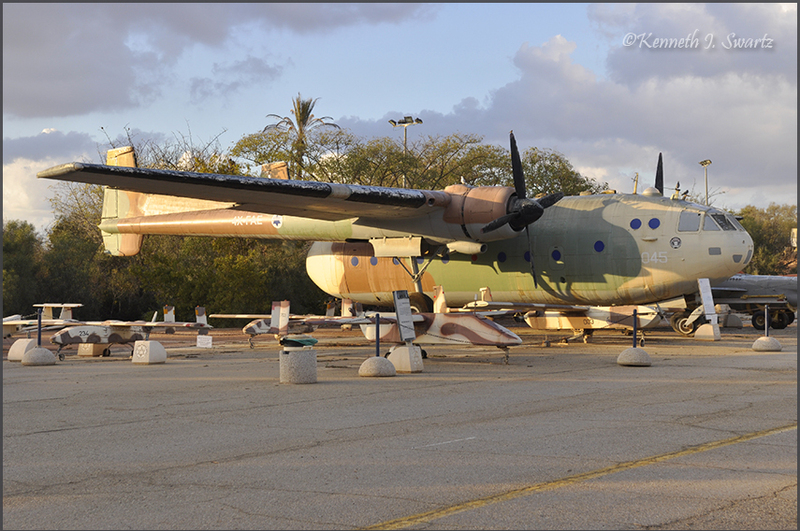 Boeing KC-97G Stratofreighter 039/4X-FPN (c/n 16767; 52-2736) found preservation at Hatzerim. For more photos see Kenneth Swartz' gallery on my website HERE..
Airspeed Oxford, with titles 'The Noon & Pearce Organisation' (?) and 'Airspeed' t/t on the fuselage. 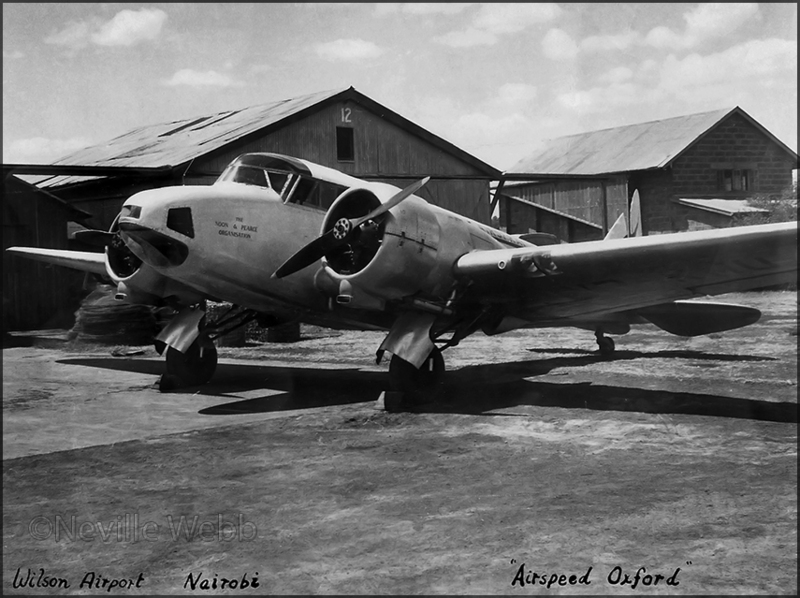 Neville Webb took this picture at Nairobi´s Wilson Airport, approx 1961.
amount of aircraft were converted from military AS.10 (post WW2r) to civil use. Wikipedia has a good list of Oxford variants. I could not place The Noon & Pearce Organisation. 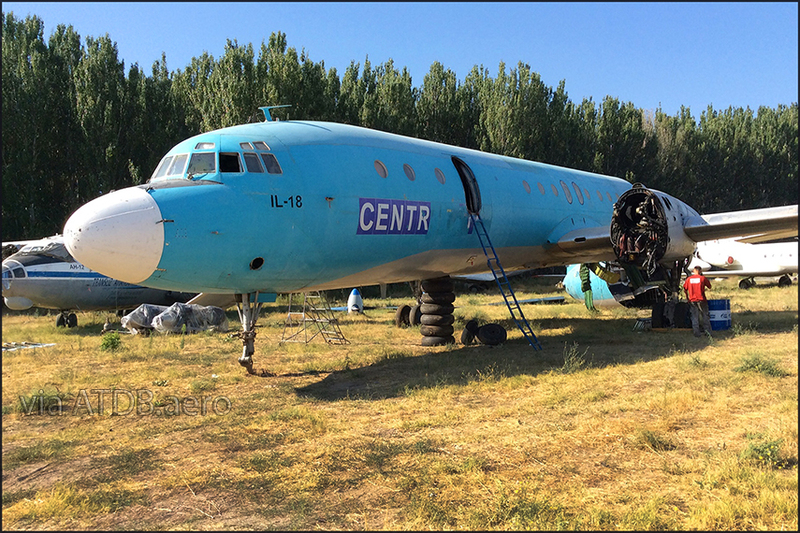 C-118 N43872 has been moved (2016?) 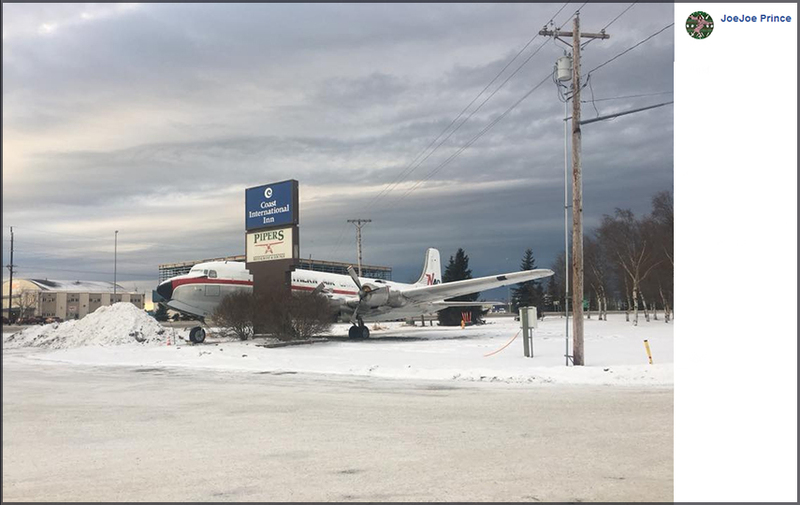 from the Air Museum on Lake Hood to a nearby motel. 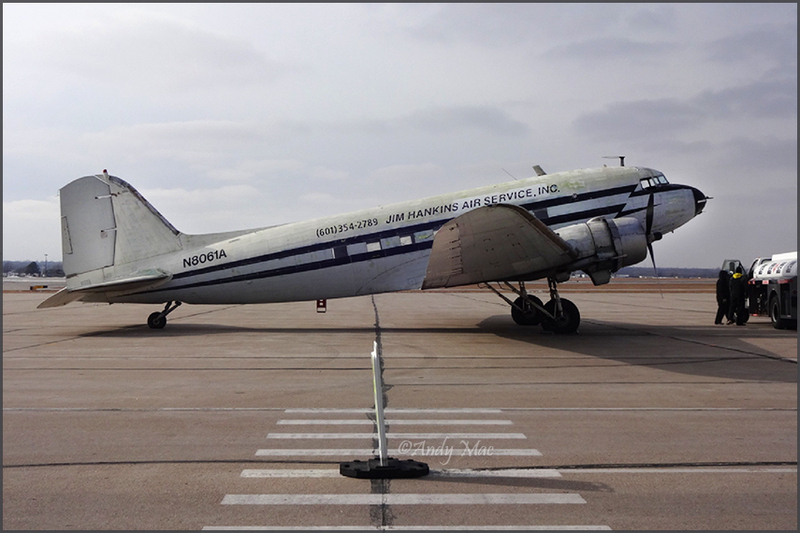 Curtiss C-46F Commando N800FA, ex/ Fairbanks Air Service (of Alaska). Only a 2:30 drive from Niagara Falls! Some 135 miles / 220 kms. Previous identities of c/n 22595: 44-78772 - N67996 - N614Z - CF-ZQX. 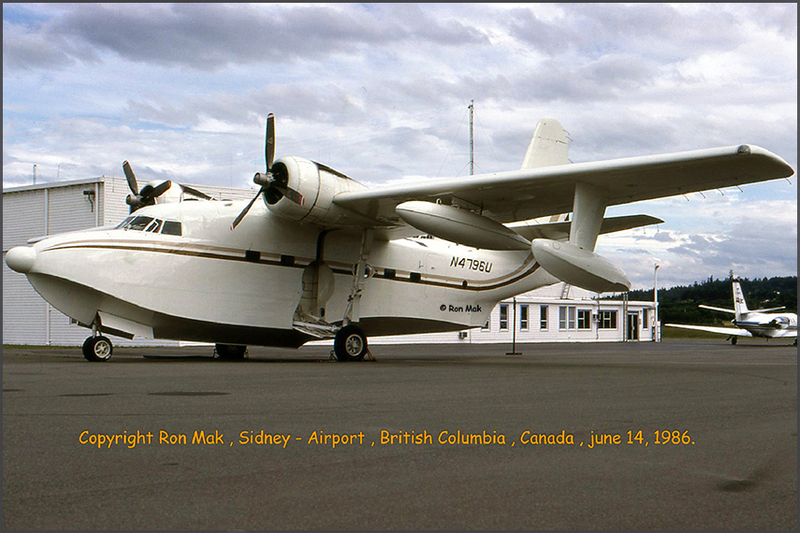 Operators such as USAAF, Flying Tigers, Zantop / Universal Airlines, Aerodyne, Trans Arctic (Fairbanks,AK), Ilford-Riverton Airways (Canada), May74 bt Fairbanks Air Service (March'76 renamed Great Northern A/L, rr N800FA). 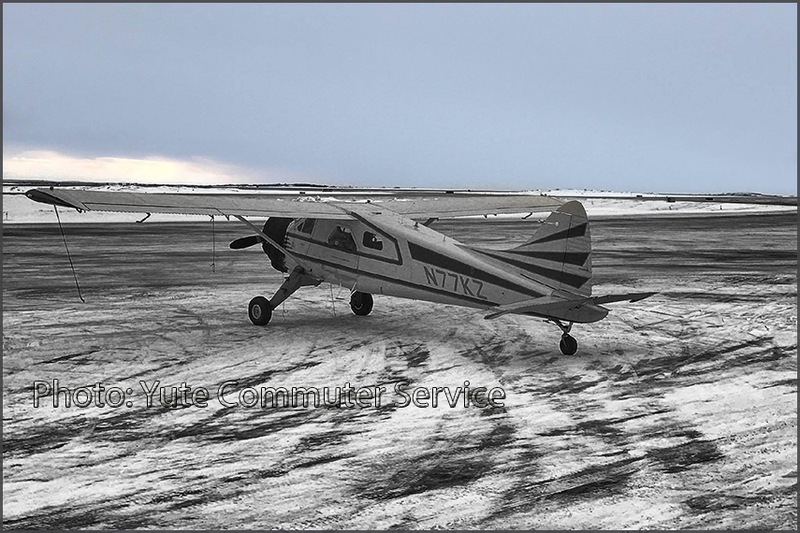 Damaged on 17Mar75 while landing at a frozen lake 100 mls SE of Barrow,AK. But repaired & bt Coffe Point Fish Co. for US$65000,-. In Apr84 bt Atone Air Inc, El Paso,TX. Probly seized for smuggling, 10dec87. Preserved at Smithsonian Museum Store, Geneseo NY in the 1990s (acquired 31Aug88). On loan to National Warplane Museum (Elmira,NY) by April 2000, transported by truck to Elmira and reassembled (parked on ramp until summer of 2002) . 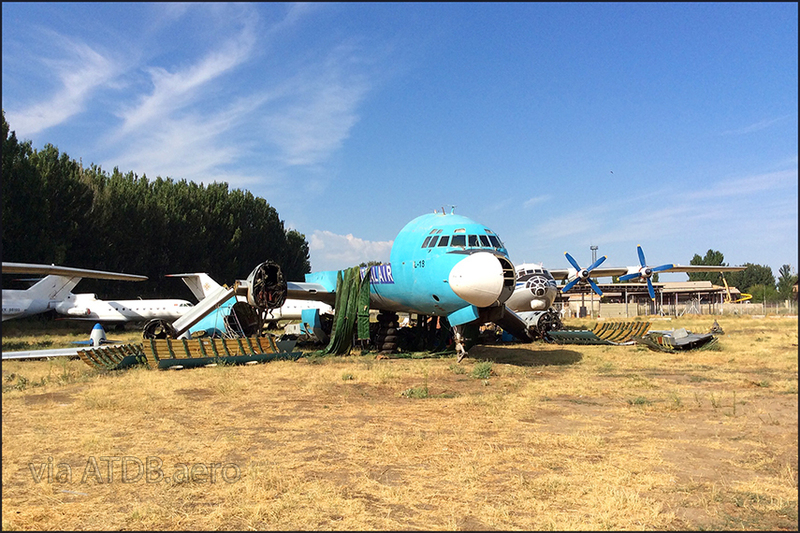 Failed to restore to airworthiness, due lack of sufficient funding. 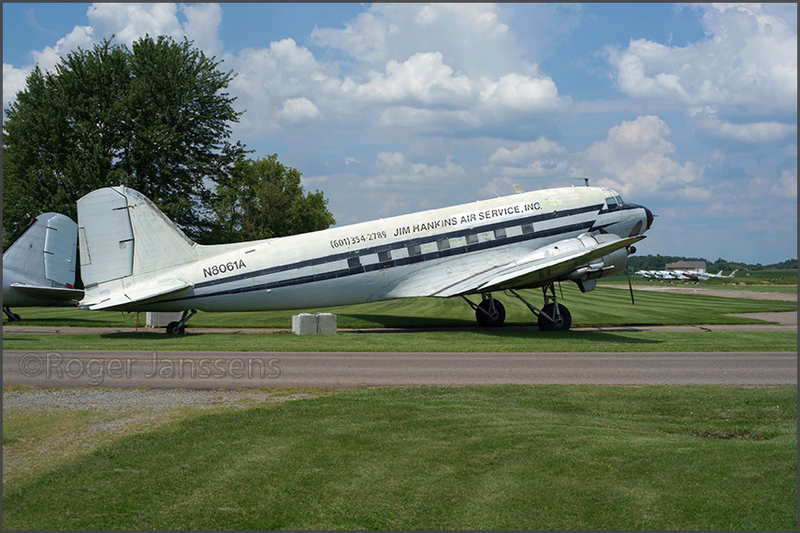 The loan of N800FA was transferred to the Glen H. Curtiss Museum, the actual move was in July 2002, but it took until Sep. 2003 for all permits for display in front of museum to be in order. 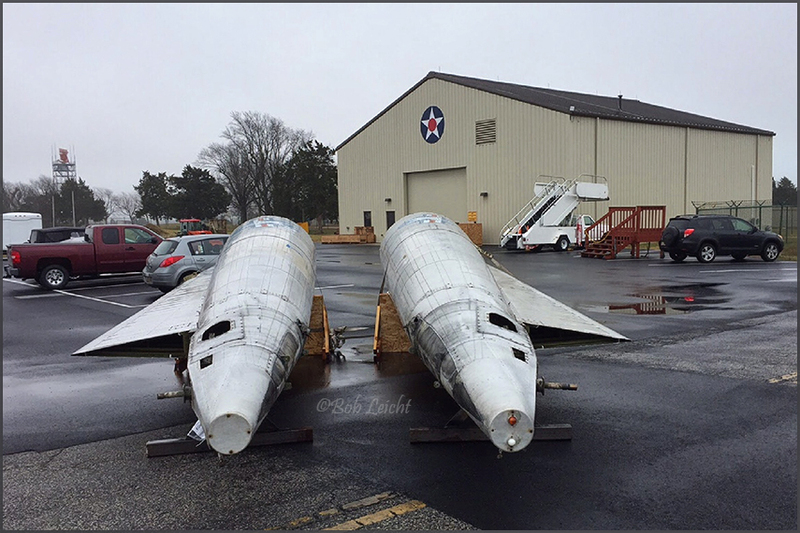 Last I heard was a process of deaccessing N800FA to the Glenn H. Curtiss Museum (2005?). Want to see the badge that has been erased on the tail? Check m.aerialvisuals.ca Also more photos & details there. 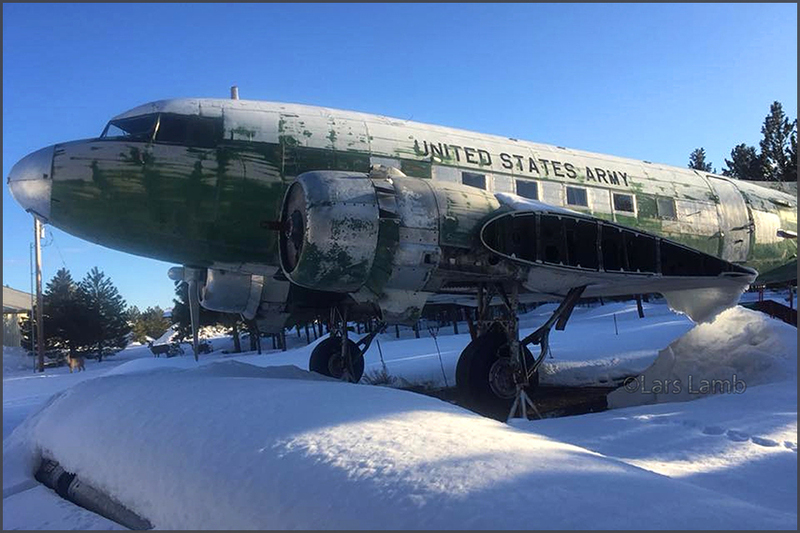 You'll find a 2018 photo of this Curtiss C-46 on Ken Swartz' gallery here, now repainted to a WW2 camo scheme and serial 4478772 painted on.